Plagiarism is the wrongful copying of an author’s thoughts and ideas. The internet allows free expression of thoughts and an ample amount of resources to serve as a source of information and inspiration. Unfortunately the ability to freely read and write anything has lead to a major problem of plagiarism across the internet. Websites often plagiarise content directly from one another, and it becomes difficult to ascertainthe original source of that information. This is true for students as well, as they have no way of knowing the originality of a paper they may have written, especially the ones that they have to submit to an educational institute where they are heavily scrutinised. This is where plagiarism checkers come in. 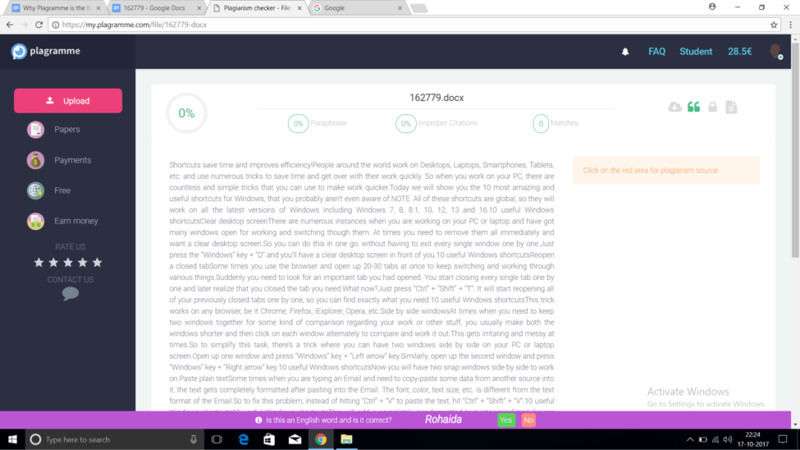 my.plagramme.com is one of the best plagiarism checkers for students who want to check their papers for potentially plagiarised content before submitting them to an educational institute. 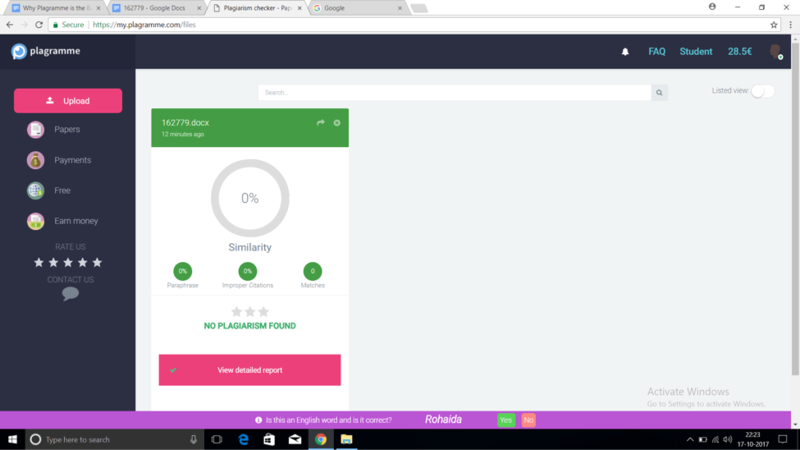 Plagramme is a plagiarism checker that checks for similarities between your document and other documents across the web, mainly through two scores – Similarity Score and Plagiarism Risk Score. Similarity Score shows the percentage similarity between your document with other documents and pages on the web. Plagiarism Risk Score indicates the concentration of those similarities in your document. Together they will either give a positive or a negative result. A positive result means that your paper is original enough to be submitted and vice versa. This makes it easy for you to read the result. There are even more factors you may consider important to deduce whether your document is considered plagiarised and for that, there are a few more scores provided by Plagramme that you can look at. These are Paraphrase Score, Bad Citation Score and Matches. In case your institute requires certain other factors to be checked before accepting your paper, these three scores will cover all bases and you can decide for yourself based on scores in each individual test. This transparency of results makes it a viable software for application across many different institutes. Plagiarism report can be downloaded by any user but you may share your documents only with your professor. That is entirely upto you. Microsoft Word as well as DOC and DOCX formats are supported, covering a vast number of bases as most papers are written in these formats. 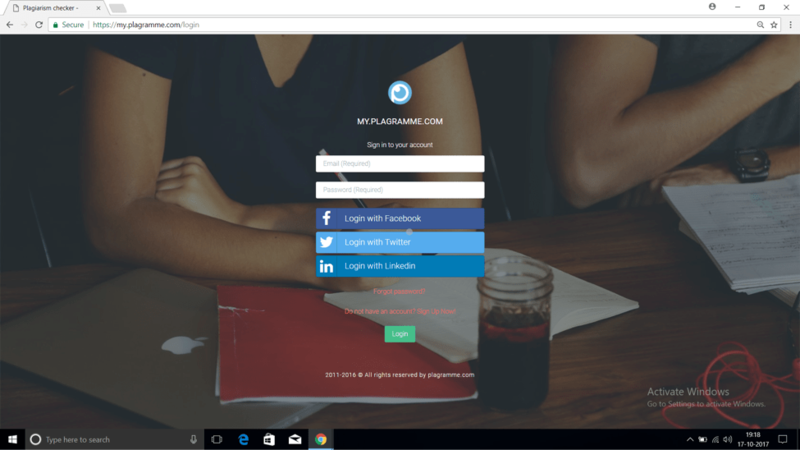 Plagramme is a very secure software which uses SSL security technology to connect you to a server through an encrypted link. Encryption is a modern technology used in various applications such as Whatsapp to protect data, in this case your document, from being accessed by an intermediary, such as your Internet Service Provider. It works by encrypting your data as an arbitrary code which can only be accessed by you and cannot be read by anyone else. Encryption is one of the best security measures available now. Uploaded documents will be anonymously compared to other pages and you can delete them from the servers. This maintains the privacy and ownership of your document. The User Interface of my.Plagramme.com is as simple and easy to use as it gets. 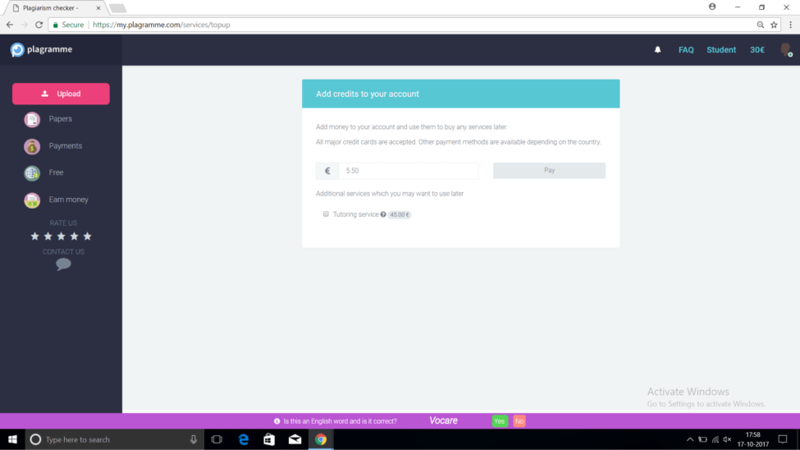 After logging in there is a bar on the left side of the screen allowing you to upload your desired document, submit payments, earn free credits and earn money through protecting your own document and RUI. On the top bar of the screen there is an option to read an FAQ or Frequently Asked Questions, with an in-depth look at the various tools the website has to offer and how to access them. It is a simple and fast UI that enables you to quickly access all the tools you need. A fact unknown to many is that most of your work can be legally protected by marking them as your Intellectual Property. There are some requirements to declare them as your Intellectual Property of course, and Plagramme processes that information and protects your work for you. So how do I earn from that, you may ask. As an IP owned by you any citation or use of your documents, thesis and other forms of writing will require licensing through you. You can charge for these licenses, and the amount you charge is upto you. What’s more, once you’ve protected one of your documents you can keep earning from its licensing throughout your life making it a valuable additional source of income. Payment is simple. You can add money to your account via credit cards. All major credit cards are supported. There are also other payment options available depending on your country. For example in India you can pay through online banking and PayPal. Most developed countries have multiple payment methods available. After adding credit to your account you can purchase any service on offer. It is simple, cheap and convenient and better than having to use your card everytime you want to purchase a service. It is very easy to contact support. Rather than going through the hassle of email you can contact them directly though the site. What’s more, instead of an automated reply an administrator will return to you so you can communicate your problem and find a solution. So these are the reasons why Plagramme is such a great plagiarism checker. Its easy to use, it offers fantastic services, it gives detailed reports and is as secure as it gets. As a student and researcher there is little alternative to Plagramme, and as a student who uses it myself, I can vouch for it as being instrumental in cross checking my papers for similarities that I cannot find myself. You can also use SmallSEOTools for plagiarism check.